Easter 2019 - Click to see the rest. Next Bishop’s Committee meets: April 28th. Potluck after with plenty of food for everybody. Apr. 28: Morning Prayer with Anne. Bishop’s Committee and potluck follows immediately after the service. May 5: Holy Eucharist with Paul as E.M. No priest has been assigned as yet. May 12: Morning Prayer with Quiet Reflection with Cole. May 15: Community dinner is Mother’s Day Delight. Signup is in the hall. May 19: Holy Eucharist with Rev. Deb and Anne. May 26: Morning Prayer with John. 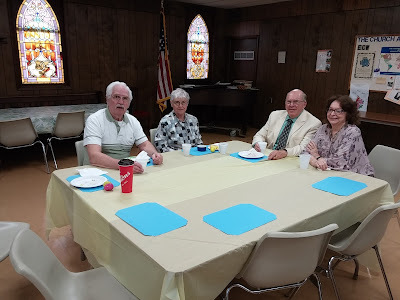 Bishop’s Committee and potluck following the service. We have several lay Eucharistic Visitors who are ready and willing to deliver Communion to anyone who requests it. If you know someone please contact Cole to set an appointment. Youth for Understanding is looking for host families to house foreign exchange students. If you are interested please call 989-777-4420 ext. 4247. There are many worthy causes to which you may donate time, food, money, and clothing: Warm the Children, InterFaith Shelter, Food Pantries, Toys for Tots, Adopt a Family. Check with the Community Action Agency for more information on these and many other organizations that work with people in need. If you need a pledge card or number please see Cole or Harry. Have a Cool Idea for church-related activities? Contact any BC member or come to one of our meetings. If you would like to contribute to the alter guild for flowers or candles, please contact Holly or Anne. The guild does not have fundraisers or special monies and so they are dependent on the generosity of individuals like you. We are using the favorite hymns suggested by several parishioners. If you would like to see one of yours incorporated into the service write down the name and put it on the secretaries desk. There are several Sundays still available for memorial flowers. Please see Holly or check out the chart in the Guild Hall for details and dates. Please click HERE for comments or suggestions.